The production about an unfriendly encounter with aliens is said to be the most expensive ever for Syfy. George R.R. Martin ( "Game of Thrones") wrote his novella "Nightflyers" back in the late 1970s, which was a parlous time for the author. "Nightflyers" was then optioned by a little-known screenwriter named Robert Jaffe, whose single credit to that point was the movie "Demon Seed." The option languished and a job in real estate beckoned once again for Martin. Martin has little to do with the series because he's bound to HBO, but he did sanction the producer, Jeff Buhler, a horror specialist best known for the 2008 adaptation of Clive Barker's "The Midnight Meat Train." 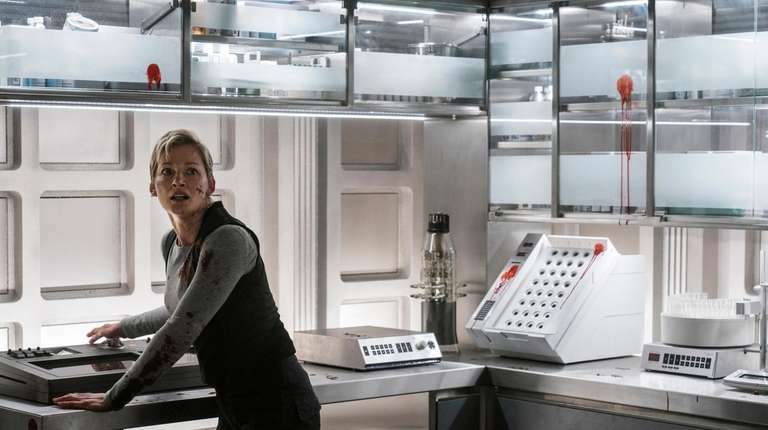 I spoke recently to Buhler about "Nightflyers," and an edited version of our chat follows. I imagine this story and this series have a lot of importance to Martin. Did he have much input in this project? George has said in many interviews that the film saved him from becoming a real estate agent [so] we can all thank the film for keeping him writing. [But] he's a little busy right now, writing other books, developing ['Game of Thrones'] spinoffs, so we were very particular about how much time we requested [of him] but he was able to check in with the development and understood the direction. "Nightflyers" is part of Martin's so-called "Thousand Worlds" fictional universe. What does that mean exactly? The Thousands Worlds that 'Nightflyers' exists in is the human one many centuries in the future, in which the human race has evolved different talents and we've discovered other species. In the TV series, I just didn't want to appeal to hard-core science fiction fans [so] I dialed back to the near future, or 75 years from now. One of the lead characters, Melantha Jhirl — played by British-born Jamaican actress Jodie Turner-Smith — was portrayed as white on the book covers, but Martin has said the publisher forced him into whitewashing the character, who was supposed to be black. Is this portrayal an instance of righting an old racial wrong? Yeah, for sure. She's an incredible actress and I would have cast her in any role we could, but it turns out George had a bone of contention with the publisher [which didn't] want to portray a black woman on the cover. He needed to sell books and there was a lot of pressure to whitewash the cover so he succumbed. It left a bad taste in his mouth [and] he was very adamant about making her a strong black character. We were happy to do that. This has been called the most expensive series in Syfy history, and from the look of the spaceship — a whirling, twirling beauty that drifts artfully through the frigid wastes of deep space — it doesn't look cheap. Was this the record-buster? That's what I've been told and I would say the bulk of the money is on-screen. We wanted to build a real spaceship and rely as little as possible on special effects . . . We were very fortunate to find a soundstage in Limerick [Ireland, where the series was filmed] that could convey the scope of the production [and] make it feel real and make it feel like something we've never seen before.